The determining factors for the establishment and operation of the Underground Railroad in the Mid-Ohio River valley were a matter of geography, politics and religion. For all practical purposes, the groundwork supporting the Underground Railroad was laid when Manasseh Cutler authored Article 6 of the Ordinance of 1787 of the United States Constitution, which excluded slavery from the Northwest Territory. In 1785, a group of former Revolutionary War officers from New England, led by General Rufus Putnam, formed the Ohio Land Company in order to purchase a large tract of land in the Northwest Territory and sell it in parcels to other American settlers. The first settlement was at Marietta in Washington County, at the confluence of the Ohio and Muskingum Rivers. These pioneers with the Ohio Land Company greatly influenced the anti-slavery attitude not only of early settlers in Ohio, which became the 17th state in 1803, but in the other states formed within the Northwest Territory as well. Manasseh Cutler was born in Killingly, Conn., on May 3, 1742, and worked on his father's farm while being tutored for college by the Rev. Aaron Brown. Cutler graduated with honors from Yale University in 1765, then married Mary Balch of Dedham, Massachusetts, the following year. After studying law, he was admitted to practice in Massachusetts courts in 1767. 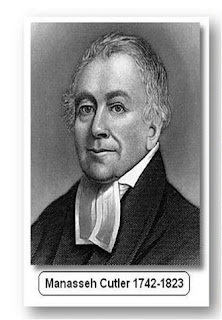 The next year he was licensed to preach at Hamlet Parish, at that time a part of Ipswich and, later, of Hamilton, MA. During the Revolutionary War Cutler served as chaplain in Col. Ebenezer Francis's 11th Massachusetts Regiment. At the close of the war, he returned to Hamlet , where he undertook the study of medicine in order to be able to minister to both the spiritual and physical welfare of his congregation. Notwithstanding the many duties of his active life, Cutler continued his habits of study and found time for research in astronomy, meteorology, botany and kindred sciences. He was the first to scientifically examine the flora of New England; some 360 species were examined and classified by him. As a scientist, he was second at this time only to Benjamin Franklin, a friend whose tastes and interests in life he shared. When the Association of Revolutionary Officers was organized for the purpose of settling on bounty lands in the Northwest Territory, awarded to them for their service in the war, Dr. Cutler took an active interest in the movement. He was one of five officers appointed to draft a plan for the Ohio Company, whose directors appointed him in 1787 to purchase land along the Muskingum River, a tributary of the Ohio. Because Dr. Cutler's land purchase was dependent on the form of government chosen for the Territory by Congress, he became engaged in writing relevant provisions of the Northwest Ordinance. His success in uniting discordant political elements made possible the enacting of Article 6 forbidding slavery in the Territory. In December, 1787, the first company of men under General Rufus Putnam left Ipswich by flatboat for the Muskingum, arriving in Marietta on April 7, 1788. The following year, Dr. Cutler started a 29-day, 750-mile journey in his horse-drawn sulky to visit the new settlement, arriving in Marietta on August 19th, 1789, in time to attend the opening of the first court in the Northwest Territory. Before returning to New England Dr. Cutler visited a number of ancient native American earthworks in the vicinity of Marietta with his son Jervis. For a while he contemplated moving his family to the new settlement but finally judged that it would require too much sacrifice and abandoned the project. Manasseh Cutler's eldest son Ephraim was born April 13, 1767, and brought up in Killingly by his grandfather Hezekiah Cutler. He left Connecticut on June 15, 1795, with three shares of stock in the Ohio Company lands and arrived in Marietta three months later. Sadly, two of his young children died on the trip. Early in 1799 he moved a few miles up the Muskingum to Waterford, where he was involved in the mercantile business before moving in May of that year to an 1,800-acre farm on Federal creek, where he erected a mill. Shortly thereafter, Ephraim Cutler was appointed Judge of the Court of Common Pleas and Justice of the Peace by the first Northwest Territorial Governor, Arthur St. Clair. He was also appointed a member of the Northwest Territorial Legislature and in 1802 became Washington County's delegate to the Ohio Statehood Constitutional Convention. His anti-slavery contribution at the convention was his introduction to the Ohio Constitution of the section that excluded slavery in the state. Both Cutlers, Mannaseh and his son Ephraim, thus played a big role in Ohio’s becoming a free state, which in turn helped lay the track for Ohio's Underground Railroad. When Ohio became a state in 1803, Washington County already had a small but vocal population of anti-slavery advocates. With the invention of the cotton gin and passage of the Fugitive Slave Law in 1793, anti-slavery advocates had gradually come to realize that slavery in the United States was never going to end by negotiated emancipation. During the period 1806-1810, through his extensive contacts among Quakers and other anti-slavery advocates in Ohio, Judge Ephraim Cutler began informally to enlist assistance from abolitionists for fugitive slaves crossing the Ohio River. In 1806 he established his family in a new home on the Ohio side of the river six miles below Marietta in a community later named Constitution. His home became the model for Underground Railroad stations on the northern side of the river. By 1810 settlers in Ohio were becoming increasingly aware of the brutalities of slavery as related, and demonstrated, by these fugitives. The exact date when Cutler began operating an Underground Railroad station at his home is not clear, but by 1810 he and his friend Colonel John Stone, who lived a few miles down-river in Belpre, OH, were helping fugitive slaves from Wood County, Virginia, begin the first leg of an Underground Railroad line (roughly following present-day Washington County Rt. 3) that ran northwest from Constitution through heavily forested hills and across Barnett Ridge to the James Lawson station at Barlow, also in Washington County. The village of Cutler, named for Ephraim Cutler's son William Pitt Putnam, also became an Underground Railroad Station in western Washington County. From this time and place the Underground Railroad spread very rapidly along the “River Jordan” separating free and slave states, not only to other points in Ohio but, over the following decade, westward to Indiana and Illinois as well. In the meantime, Judge Ephraim Cutler introduced the first bill in Ohio for the regulation and support of public schools and became a trustee of Ohio University at Athens in 1820. He was the author of the ad valorem system of taxation, the foundation of a tax credit enabling Ohio to build and maintain canals, and was also active in the Presbyterian Church. From 1842-1853 he operated the first post office, the only one in the nation named for the U.S. Constitution, from his stone house by the Ohio River. 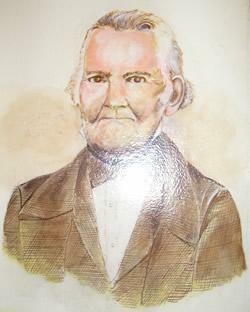 Cutler died peacefully at home at the age of eighty-six in 1853. Today Constitution is located on State Route 7 in Washington County, six miles south of Marietta and about four miles north of Belpre, OH. Besides its importance as an early Underground Railroad station, the rural community was the site of the Constitution Grindstone Co., one of several firms in Washington County that supplied 90 percent of the heavy millstones in the United States in the 19th Century. The hard work furnished employment for many local residents, including a number of African-Americans living in that part of the county. The above plaque, erected at the Ohio River Museum in 2008, is one of 24 for which Henry Burke secured funding from the Ohio Historical Society. (Two others were funded by the West Virginia Division of Archives and History.) All were made by Sewah Studios of Marietta, OH. 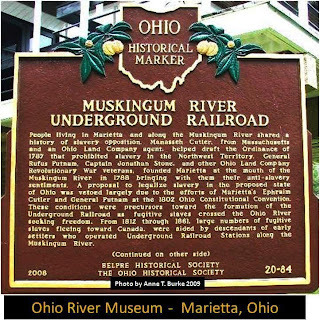 The text on the front of the plaque (above) reads: "People living in Marietta and along the Muskingum River shared a history of slavery opposition. Manasseh Cutler, from Massachusetts and an Ohio Land Company agent, helped draft the Ordinance of 1787 that prohibited slavery in the Northwest Territory. General Rufus Putnam, Captain Jonathan Stone, and other Ohio Land Company Revolutionary War veterans, founded Marietta at the mouth of the Muskingum River in 1788 bringing with them their anti-slavery sentiments. A proposal to legalize slavery in the proposed state of Ohio was vetoed largely due to the efforts of Marietta’s Ephriam Cutler and General Putnam at the 1802 Ohio Constitutional Convention. These conditions were precursors toward the formation of the Underground Railroad as fugitive slaves crossed the Ohio River seeking freedom. From 1812 through 1861, large numbers of fugitive slaves fleeing toward Canada were aided by descendants of early settlers who operated Underground Railroad Stations along the Muskingum River."